Catalina 30 Sail Cover -- One Design Sailboat Covers -- The Sailors Tailor, Inc.
Made in Acrylic so the sail can breath. Covers the mainsail when lowered on the mast. Zipper down the front of the mast with snap over flap to protect the zipper. Runs out to the end of the boom and twistlocks around the end of boom. Under side of cover fastens with snaps and twistlocks. Adding your boat name with a monogram really enhances your boats appearance at the dock. We are finding that the boom length on the Catalina 30's is varying from boat to boat. Thus, in order to insure the best fit, we need you to measure your boat to obtain measurement "A" shown below. 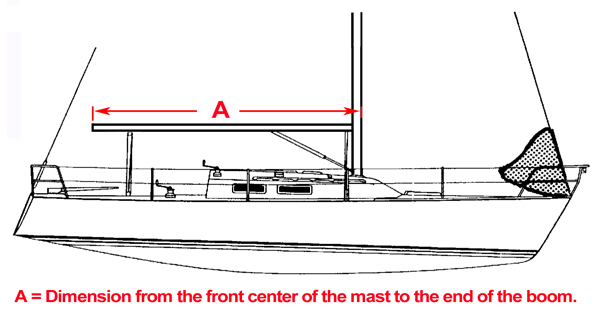 Measure from the front center of the mast all the way to the aft end of the boom following the same contour the sail cover will take once it is on. This will give us the total length the cover needs to be to get around the mast, past the gooseneck, and to then end of the boom. The reason this is important is, unlike our competitors whose covers in many cases stop short of the end of the boom, our sail covers cover past the end of your boom, and then twistlock and snap closed at the end of the boom. Knowing the total length ensures there is ample room to close up the end of the boom.